CARLISLE, Pa. – Ahold Delhaize USA’s GIANT Food Stores division celebrated the grand openings of six new stores in four states on Friday, boosting its total store count to 178. 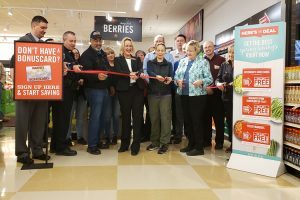 Ribbon cutting at the new MARTIN’S store in Berryville, Va.
Five of the stores, which are former Shop ‘n Save locations GIANT acquired earlier this year, are branded MARTIN’S Food Markets. They are located in the communities of Smithsburg, Md., Greencastle, Pa., Berryville, Va., Hedgesville, W. Va., and Martinsburg, W. Va. The sixth store is a new unit, operating under the GIANT banner, that was built in Warrington, Pa. to replace a store previously located in Jamison, Pa. GIANT also extended its commitment to each community through its philanthropic platform, Living Here, Giving Here. As part of Friday’s announcement, the company donated $25,000 in total to local food pantries, schools, police, and other emergency responders. GIANT will also ensure each store is assigned a feeding agency partner to receive weekly food donations through the company’s food rescue program, including its acclaimed “Meat the Needs” initiative, the company said. The grand openings came on the heels of an announcement by another Ahold Delhaize division, Landover, Md.-based Giant Food, that it will be opening a new store in Maryland on April 12. Located at 18140 Village Center Dr. in Olney, Md., that store will feature more than 40,270 square feet of selling space. It will also be the first Giant Food store to feature a new layout and décor package. The store will also include a larger health and beauty department, enhanced hot food offerings, a full gourmet cheese shop, expanded produce and natural food offerings, a sushi bar, full-service meat, seafood, bakery and floral departments, and both dairy as well as frozen kosher food sections. Additional store features include a full-service pharmacy, Starbucks Café, free WiFi, and a PNC Bank branch as well as self-checkout and self-scan options for shoppers. The new store replaces a store that is closing on April 11 at 17821 Georgia Avenue in Olney.